One of the lightest worm drive circular saws. It features a soft, ergonomic grip that is an excellent compliment to the cooler-running motor. Circular saws are not all that complicated when compared to the vast array of other saws out there, so that makes all the little details and features all the more important when it comes to their performance. 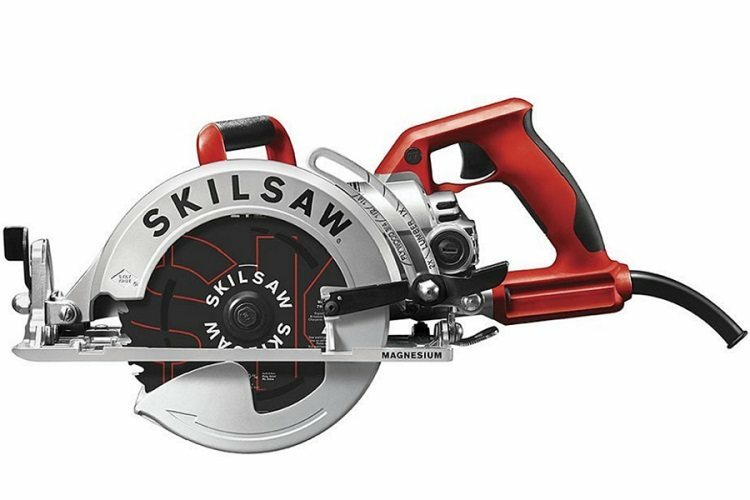 The SKILSAW SPT77WML-01 is an all-magnesium worm drive circular saw that is made for professionals that need durability, longevity, and ease of use. 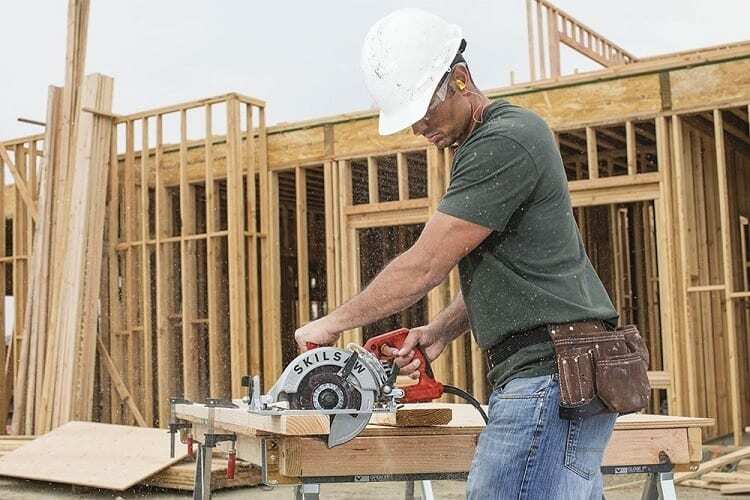 It doesn’t overlook any details, resulting in one of the easiest and most efficient circular saws you can find -- and a dream for contractors that deal with a lot of framing work. If you value lighter saws that don’t skimp on power and handling, you’ll love the SPT77WML-01 as much as I do. The 7-1/4 inch SPT77WML-01 has a number of features and aspects designed to make it easier to use for extended periods. This is in regards to reducing wear on the user and allowing the saw to continually rip through a high amount of lumber on any given day. The low weight is the first thing you’ll notice with this saw. At just 11.6 lbs, the SPT77WML-01 has the lowest weight in its class. You’ll have no problem using it all day long, noticing hardly any fatigue at all. The saw uses a powerful 15 amp motor, giving it a no-load blade speed up to 5,300 RPM. This further adds to the low effort required to rip through wood, while also ensuring a smoother cut as an added bonus. 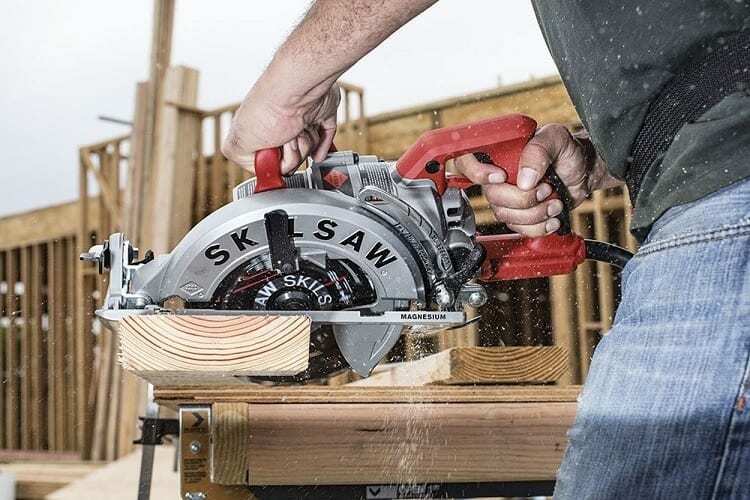 As with other SKILSAW products, the SPT77WML-01 uses a unique copper wiring method for the motor, letting it work for longer while remaining cool, avoiding the dreaded overheating you can encounter with other professional-level circular saws. The saw has an incredibly balanced feel, which is made better by the ergonomic handle and soft grip that keeps you comfortable, without relinquishing control and handling. SKILSAW’s Cut Ready depth adjustment system offers easy and quick adjustments for ¼ ply, ½ ply, ¾ ply and 2x, while an anti-snag lowers guard protects the blade when you’re not using it, and prevents it from snagging while cutting thinner materials. The SPT77WML-01 comes with an on-tool multi-function wrench for easy blade changes and maintenance, along with a 24-tooth carbide-tipped SKILSAW blade. The biggest advantage to the SPT77WML-01 is its incredibly lightweight. Circular saws can be tedious to use for longer periods of time, but not this one. The 11.6 lb weight makes it a workhorse on the job site. I’m a big fan of SKILSAW in general, and a big part of that is the little features they include such as the copper wiring in the motor. Overheating can be a serious problem with many circular saws, but not with the SPT77WML-01. You can use it for hours on end. Lightest saw in its category. The overall feel of the saw is noticeably smoother than normal. The combination of its weight, handle placement, and smooth motor operation makes it fun to use and takes the stress out of what would normally be grinding and repetitive work when on a normal job site. The saw’s cutting capacity is a major plus as well, and beveled cuts can be easily accomplished with a quick adjustment. The SPT77WML-01 is one of the best saws you can use for heavy worksite use, but there are some areas that could be improved. Given that this is geared towards construction sites, the cord shape and length are a little baffling. The cord could stand to be a beefier and more resistant to the rigors of the worksite, like the rest of the saw is. The same goes for the cord’s length. Add a few more feet to it, and it would be perfect. If you’re using gloves, the on/off switch can be difficult to operate, so it’d be nice to see SKILSAW address that in the future. The same goes for the hanging hook. Notice that all of these complaints have nothing to do with the actual operation of the saw, which is saying something. This is truly an ideal saw for framers. If you’re someone that constantly works at construction sites, the abilities the SPT77WML-01 provides you will definitely be more than appreciated in more ways than one. Really, anyone that works with lumber and needs a circular saw will love the SPT77WML-01. You don’t have to work with just wood though, as simple blade swaps allow the saw to cut through a number of other materials as well. All that to say, the SPT77WML-01 is perfectly fine for home users as well. Anyone can appreciate low weight, low heat, and easy control. The SPT77WML-01 is a top choice for those who value longevity and ease of use with a circular saw. It uses a combination of smart features and strategic material choices to make it one of the most capable and seamless circular saws on the market, and one that anyone will enjoy using. The saw’s surprisingly low price is just another reason why this is one of our favorite buys right now. If you need a lightweight circular saw that is ready to go all day, every day, this is it.